I have to admit that despite my pure enjoyment of Askinosie chocolate and my moderate enjoyment of Licorice (or Liquorice as the UK version of Word insists I spell it), I still left this bar for awhile before trying it. I suppose when it comes to licorice, the Swedes do seem to do it best and they do it salty. On top of that there was anise seed directly on the bar. I was afraid – I was very, very afraid. This was, I believe, the first of many collaborations that Shawn Askinosie has embarked on with other companies, all of whom are passionate about their ingredients. From sourcing the best coffee to obsessing over the best malted milk recipe, people passionate about something are creating specialist niches for themselves. Collaborating with others of equal passion not only helps spread the word about their products even more widely, it also helps us experience more in the chocolate world. 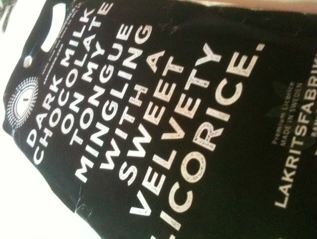 The most immediate flavour is licorice but not as strongly as I had feared. As I chew and chew flavours develop, I’m finding the licorice has actually blended perfectly. There was nothing to fear – less than nothing. The licorice has blended perfectly with the choice of chocolate and created a delightful sense of a slightly darker chocolate without bitterness. I guess I was pleasantly surprised after fearing the bar for so long. There is a distinct liquorice flavour and the back of my piece was almost completely covered in liquorice but that flavour was not the dominant one as in the coffee bar where that coffee flavour really rose to front and centre. 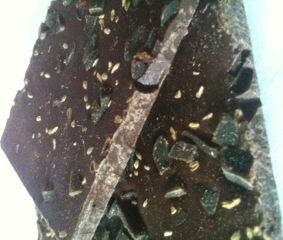 It is more like the malted milk bar where the flavour is there but it isn’t trying to be the star of the show, it is working in concert with the chocolate to create a fully blended flavour that is really nice, with a lingering slight liquorice flavour at the end (yes, I gave up and Word won on the spelling). Chocolate, however, is the dominant flavour sensation, with liquorice taking a back seat and combining with the chocolate perfectly. I think if you’re a licorice (damn you Word – I’m Canadian and I’ll spell liquorice the way *I* want to!) fan this is going to be a pleasure to discover. If you’re a chocolate fan, don’t be a fool like I was. Jump right in because the dominant flavour is chocolate!